You may have done research before in school. Maybe the research was for a science project, or learning about a historical event, or exploring a new part of the world. In fact, you might even be a research-pro when it comes to a new topic. However, when researching a completely new topic outside of school, it can be difficult to know where to begin, particularly when the topic is as big as how to pay for college tuition. That’s where we come in. Let’s go through how Virginia residents like you can finance your college education. You may have heard from your school or your friends about the FAFSA, also known as the Free Application for Federal Student Aid. Applying for the FAFSA should be the first step if you are considering college because the program, run by the federal government, gives over $150 billion of need-based funding to students who are trying to pay for college. You can even apply for the FAFSA before applying to college. You may have also heard that the FAFSA can be painfully confusing and difficult to fill out. Lucky for you, we have a step-by-step guide to completing the FAFSA questions that will get you through the form much more quickly and easily. When looking for state resources in Virginia, it’s best to begin your research at the website of the State Council of Higher Education for Virginia. This website can help you find VA colleges you might want to apply for, as well as financial aid opportunities from the state. You can check out their financial aid programs webpage, which lists all the possible state-based financial aid opportunities for students like you. We’ve also found some Virginia scholarships that might be applicable to you. Virginia Commonwealth Award is a program that gives students funding based on need. Virginia Guaranteed Assistance Program (VGAP) gives financial aid to students with demonstrated financial need, with the maximum award covering the full cost of tuition, fees, and books. Virginia Teaching Scholarship Loan Program gives financial support to students who are committed to teaching in high-need locations and subjects. There are also many grants that are offered to Virginia residents. Virginia Tuition Assistance Grant Program provides financial support to students who are pursuing a degree other than religious/theological training at select VA schools. Two-Year College Grant Program gives financial support to students who are transferring to specific four-year VA institutions after earning an associate’s degree. GEAR UP Virginia gives students with a background of significant financial disadvantage up to $2,000 of financial aid. In addition to state resources, Virginia residents also have a lot of financial aid resources through Virginia institutions. Many schools—such as the University of Virginia (UVA)—have widely developed financial aid programs that can be very helpful for students. UVA’s Self-Identify Scholarships are just one of the non-merit based offerings in UVA’s financial aid program for incoming students. Take for example the Neall Family Scholarship, which provides funding for veterans or children of veterans who wish to study engineering at UVA. Another example is the H. Kruger Kaprielian Memorial Scholarship, which is specifically for students with demonstrated financial need who are of Armenian descent. Even if you don’t plan to apply to or attend UVA, be sure to check out its comprehensive outside scholarship database managed by the UVA Student Financial Services office to see if there are any scholarships that might apply to you. Other schools, such as the College of William and Mary, also have extensive resources for incoming students. With their merit-based scholarships, such as the William & Mary Scholars, the James Monroe Scholars Program, as well as the 1693 Scholars Program, high-achieving students may be eligible to receive additional financial aid. Be sure to check out the financial aid webpage of any schools you are interested in—they might have additional grants or scholarships that you can apply to! 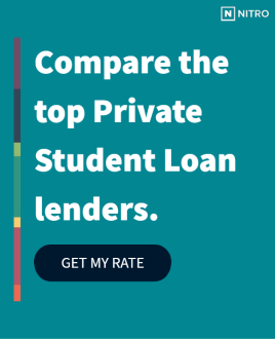 If you find yourself unable to cover the cost of college with steps one through three, you can still afford college with a private loan. However, it can be difficult to know which lender use to take out a loan. That’s why we’ve found the best banks for private student loans to help you get the best rates available. You can also use our NitroScore tool to calculate what your future finances may look like based on the school you’ll be attending, your major, and the amount of funding you already have from savings, grants/scholarships, and financial aid. With NitroScore, it’s possible to have a comprehensive idea of your college costs, including approximately how long it will take you to pay off any student loans. Now that you have these tools to help you pay for college, you can be self-assured that you are on the right track to paying for your education!